The holiday tradition of hanging a pickle ornament on ones Christmas Tree has been around for over 100 years and is celebrated in homes across the world. 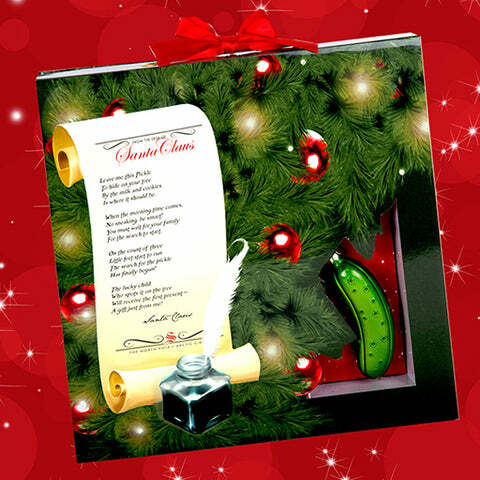 Legend says that the first child to find the Pickle on Christmas morning has the honor of opening the first present– an extra gift from St. Nick. There are many versions of how this tradition came to be, but until now, no one knew the truth! Join us on a journey to the Old North Pole where you’ll discover the story of Pickle Elf, and learn how the legend came to be. Leave me the Pickle. To hang on your tree. By the milk and cookies. Is where it should be. When the morning time comes. No sneaking, be smart! You must wait for your family. For the search to start. On the count of three. Little feet start to run. The search for the pickle. Has finally begun! The lucky child. Who spots it on the tree. Will receive the first present. A gift just from me.